No. Your eyes are not playing tricks on you and you haven't been magically time-warped to November! My youngest two children and I just celebrated Barbara Reid's November birthday in April. Why, you ask? Well, she was listed as having an April birthday on an author birthday calendar that I frequently use to plan my celebrations. Luckily, I always double check (and sometimes triple check) to verify the author's birthday before posting it on the blog. Once I started my research for this blog post, I found other sources that had her birthday as November 16th. So, I emailed Barbara and she replied almost immediately to confirm that her birthday is November 16th! Thank you, Barbara for confirming your birthday with us! I thought maybe this could be our first half-birthday author celebration, but we were off by a month there too. Oh well, my children and I had so much fun reading Barbara Reid's books and experimenting with a new illustration technique that I couldn't wait 7 months to share it with you. Barbara Reid is an author and/or illustrator of over twenty picture books including Fox Walked Alone and Two By Two. 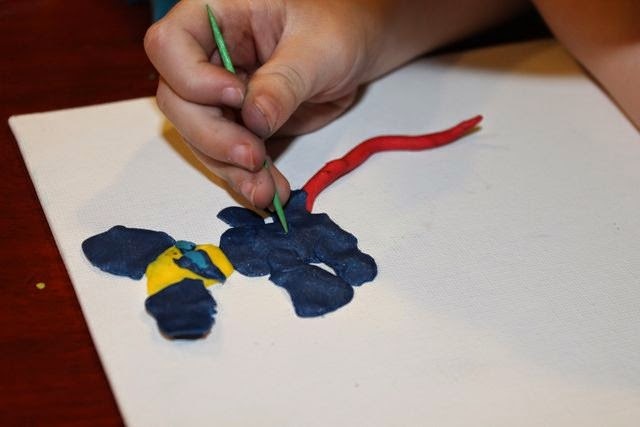 Her unique illustration style utilizes plasticine, a soft, oil-based modeling material, to create the images in her children's books. According to her website, she experimented with plasticine as a student at the Ontario College of Art and Design, but recalls, "When I was little my mom would give me some modeling clay, and I'd play happily all day. I'd make buildings, people, animals, even whole villages." 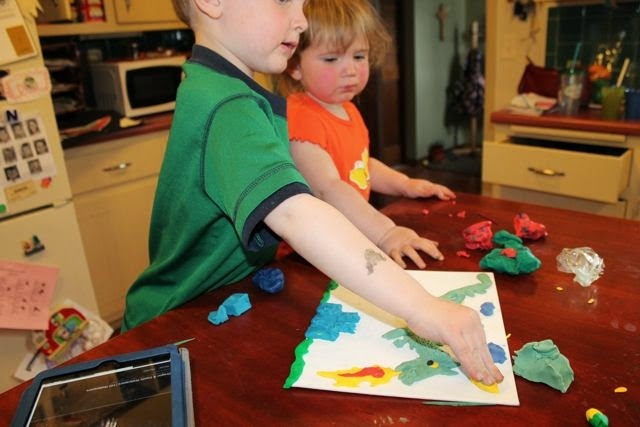 (The Ultimate Guide to Classroom Publishing) Her first picture book, The New Baby Calf by Edith Newlin Chase, was illustrated using plasticine in 1984. This best-selling book was the beginning of a career in children's literature that has been highlighted by awards such as the UNICEF Ezra Jack Keats Award, Governor General's Award for illustration, and an Elizabeth Mrazik-Cleaver Canadian Picture Book Award. Her latest picture books are Picture a Tree and The Night Before Christmas. Our birthday celebration for Barbara Reid was very spontaneous. 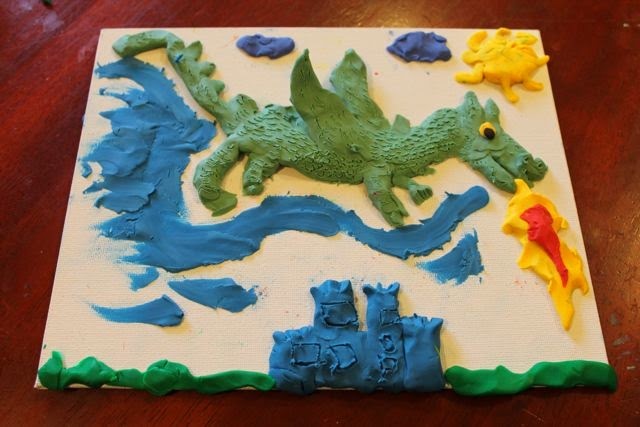 I already had the books checked out from the library and I knew I had a bag of various colors of plasticine (modeling clay) in the basement. I was just waiting for the right time to embark on this project with my children. 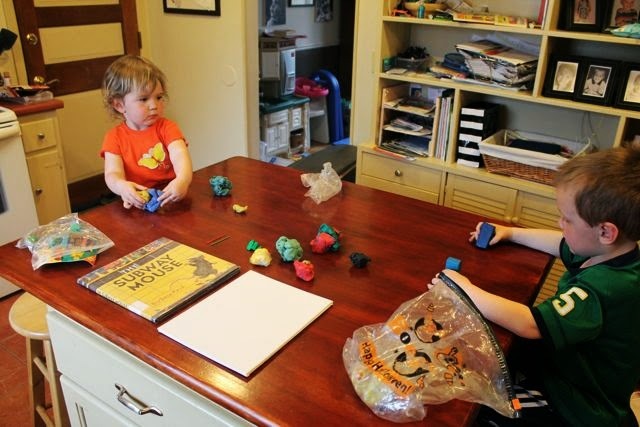 My three-year-old son came home from preschool one day this week asking to do an activity with his sister and I. He suggested doing a craft inside. 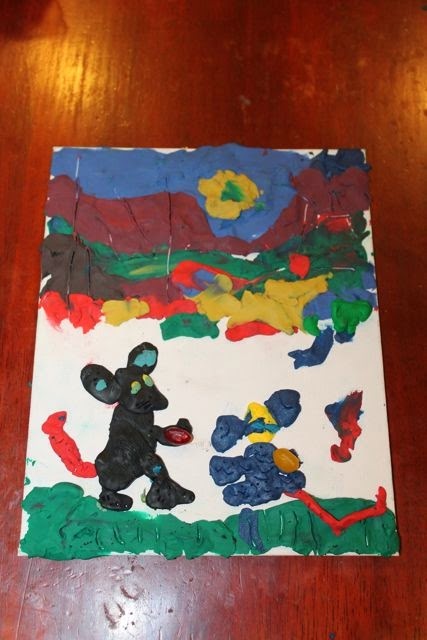 So, I gathered the books, the plasticine, two sturdy canvas boards and the celebration began! 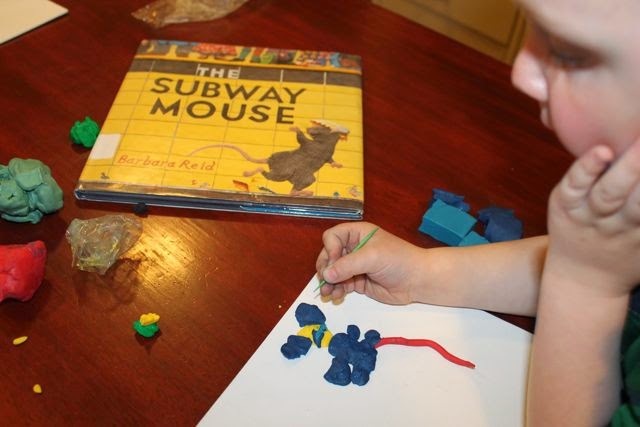 We started our celebration by reading The Subway Mouse about a mouse named Nib who grew up in the subway hearing stories about Tunnel's End from his elders. One day, when he was older, he decided to find out if the stories were true about Tunnel's end. On his adventure he battles hunger, meets a travel-worthy companion, wanders empty track, and mistakenly steals the big mouse's jellybean before reaching his goal. Tunnel's end was "more beautiful than he had dreamed." 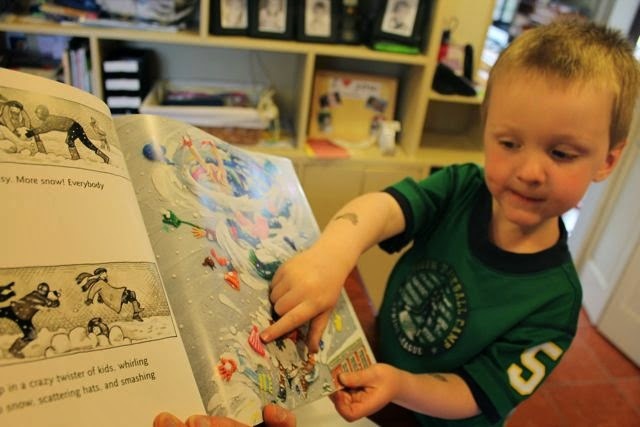 As we read the book, I found it interesting that when I asked my son about the illustrations in the book he was unable to tell me that the illustrations were any different that what he has seen in other picture books. 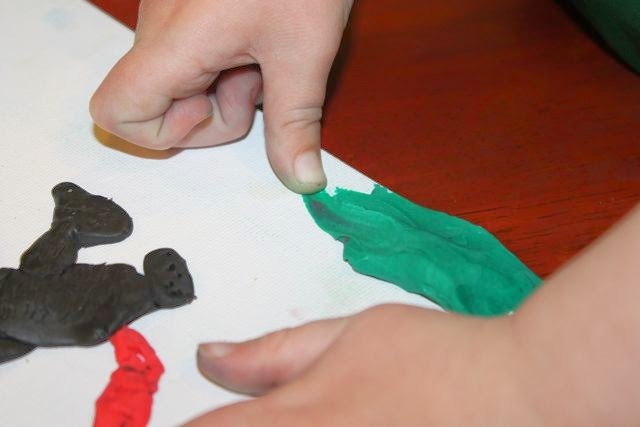 I even asked him if they looked like they were made with clay or play-doh and he just shrugged his shoulders. 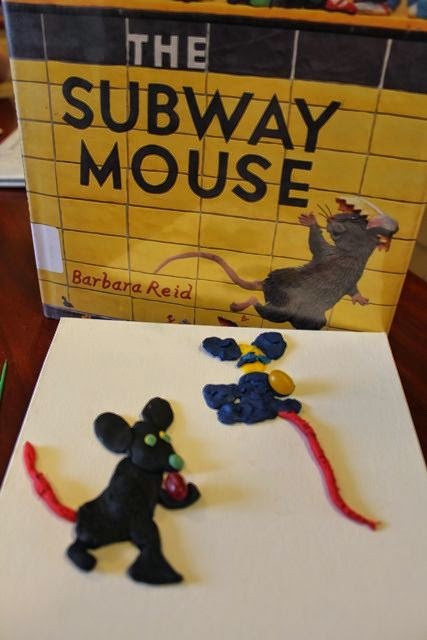 After reading the book, we got out the plasticine and I asked if they would like to make a mouse. 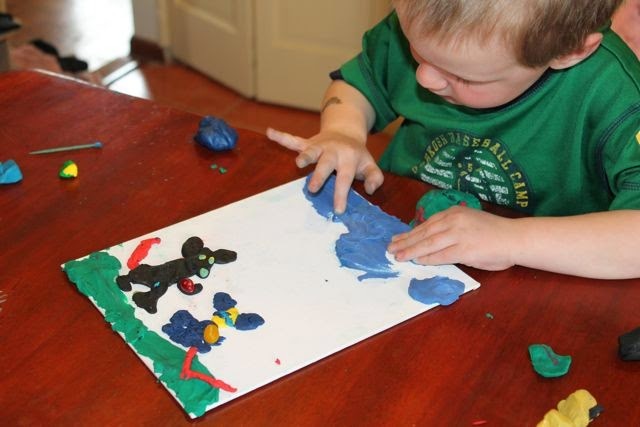 My son was really interested and started squishing the plasticine on the canvas board. He didn't know how to make a tail for his mouse. I asked him if he could roll one and he was quite pleased with how easy it was! 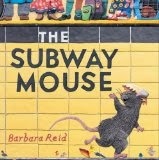 We examined the illustrations in The Subway Mouse and noticed that Barbara Reid added texture to her illustrations. We used a toothpick to make the hair on our mice. 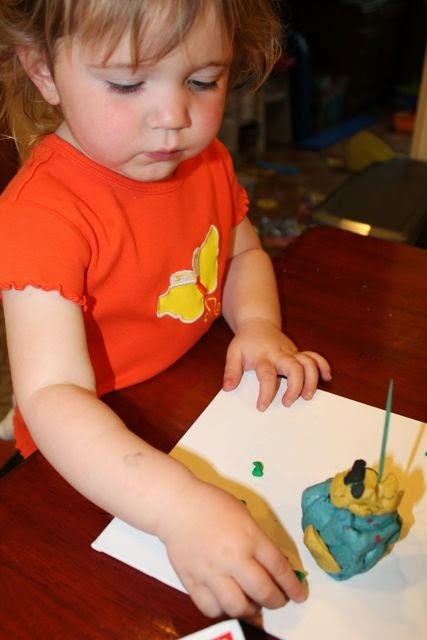 Meanwhile, my daughter was making a creation of her own. He was really examining his work. I said to him, "You are an artist." He replied, "Why am I an artist?" I said, "Because your mouse looks great!" He really wasn't convinced with this answer. 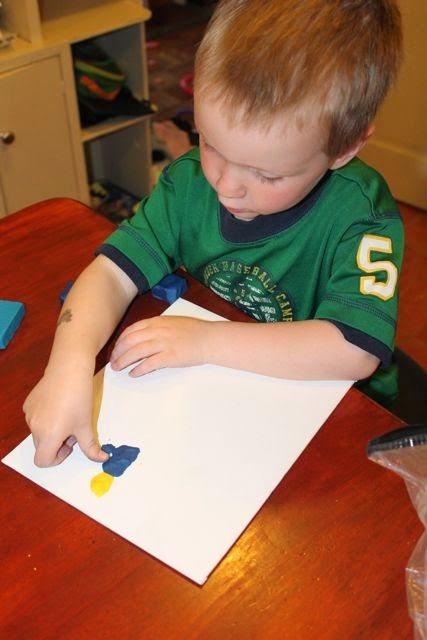 He added a jelly bean to his mouse just like Nib in the book. I made a mouse too. I added a red jelly bean, my favorite! 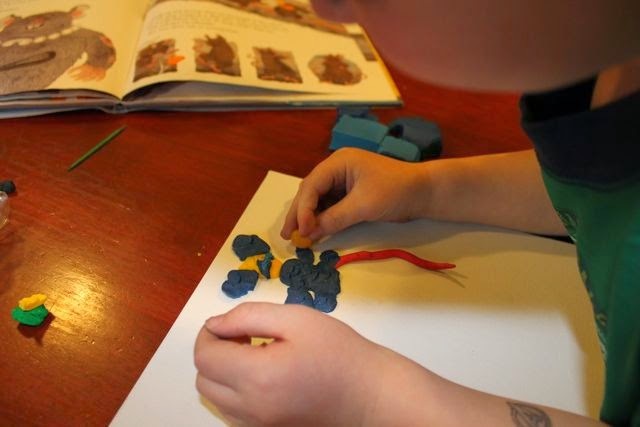 After he made his mouse, we read Perfect Snow. 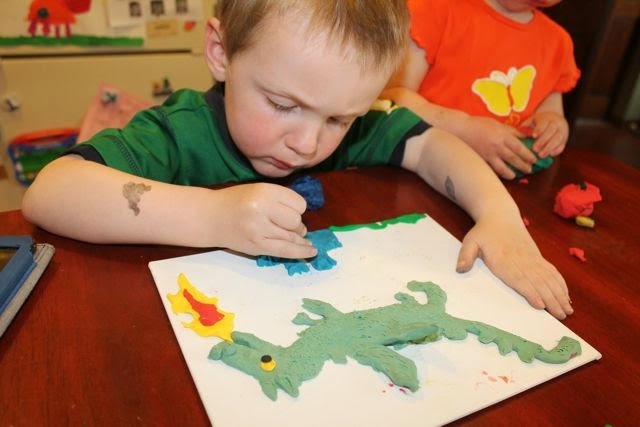 He was now able to notice that Barbara Reid used plasticine to make her illustrations. He was pointing out things he noticed on each page. I thought this was the end of our project. 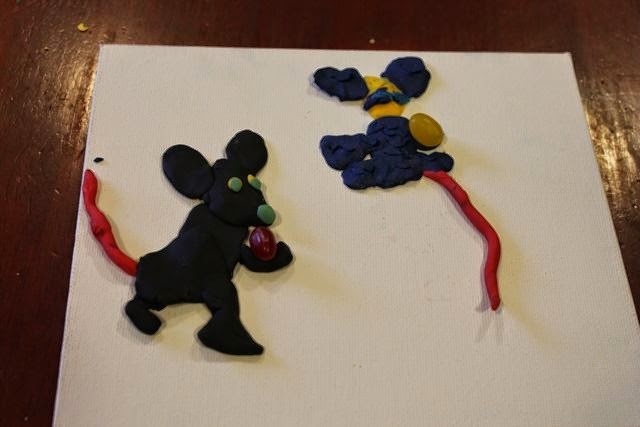 But, then we watched the video below of Barbara Reid demonstrating how she makes a picture using plasticine. He was inspired to continue his picture. He added grass. Then, he worked on the sky. He wanted to added purple to his sky just like Barbara Reid did in another video. This was his final work of art. 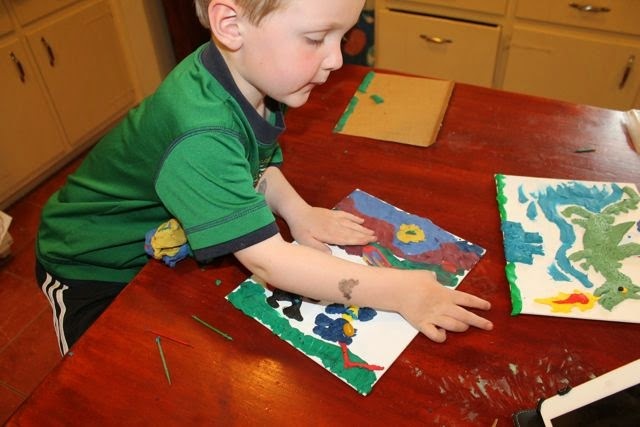 He proclaimed, "Dad, I am an artist." 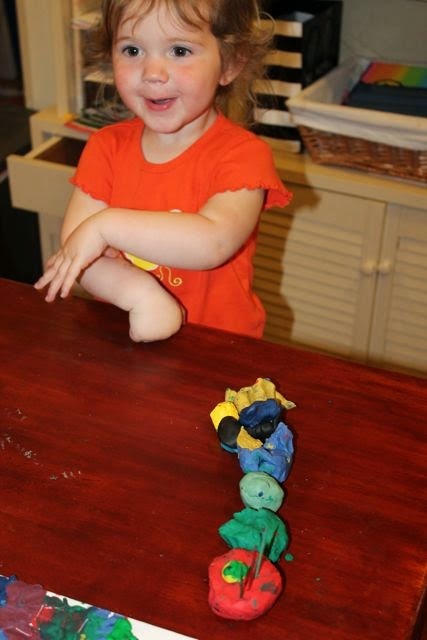 As we worked, my daughter was playing with her clay too. I looked over, and my daughter said, "Caterpillar!" 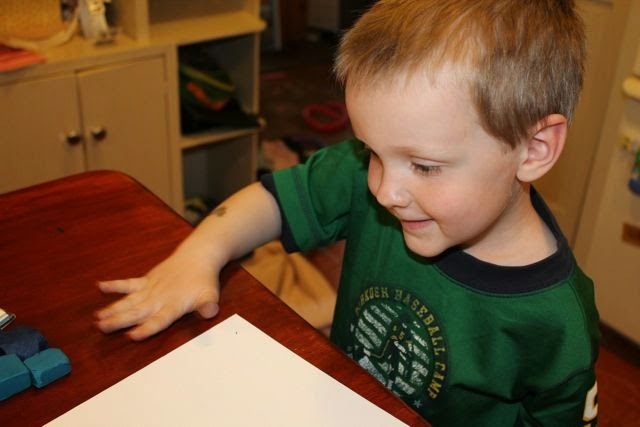 While he was working on his picture, I was working on a picture of my own. I asked my little artist if he would help me add some details. He started by adding windows to the castle with a toothpick. He added a sun too. I hope you enjoyed this birthday celebration even though it was a little early. I will make sure that I share it again with you again on November 16th! Thank you again, Barbara for confirming your birthday with us!